iMachining with Hoffmann Garant Tools - great machining results! 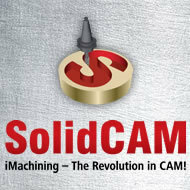 ..showed SolidCAM 2.5D, HSS and, obviously, the highlight iMachining - they could not believe what I show them on the screen! iMachining of very hard steel at Rhytem Plast - saving 87%! Old Machine, cut very hard steel with iMachining. Customer told us that we surprised him and that even with aluminum he doesn't work with such high speeds! ..Okuma sold an MB-56VA after the customer saw the iMachining demonstration, and we have a new prospect! iMachining on 4th axis big success..66% faster..
.... customer doing evaluation with trial license - at last stage wanted to mill a part with iMachining on 4th axis - we did it 66% faster - customer bought system with iMachining..
iMachining great results at customer - savings of 70% in steel! .. iMachining Wizard level 4, step down 25 mm HAAS CNC Machine - cutting time reduced from 50 min to 15 min with iMachining..
..we used iMachining 3D for the 3D Roughing – the results impressed the customer tremendously..
..both of them will buy iMachining..